A specialist nationwide haulage company based in Doncaster has moved to a new seven acre site and expanded its fleet of vehicles, following support from Lloyds TSB Commercial Banking. McGregor Logistics Ltd operates 30 vehicles and 60 trailers for transporting goods across the country, as well as five specialist temperature controlled refrigerated trailers for fresh produce. The company also supplies high-profile sporting and music festival locations across the UK and Europe, and last year it won an official contract to transport 100 loads of turf to the Olympic Stadium and Lords Cricket Ground in London. As part of its bid for the London 2012 contract, McGregor Logistics secured a five-figure loan from Lloyds TSB Commercial Banking to replace 15 of its vehicles with new low-emissions models, as they would be traveling through the capital’s Low Emission Zone on a daily basis. Due to ever-increasing demand for its services, the company has recently moved to a new seven acre site on the Warmsworth Halt Industrial Estate in Doncaster, which includes a 100,000 sq ft warehouse with twelve loading bays. The new site offers hard standing, state of the art 24/7 security and an on-site workshop for servicing its own and other customers’ vehicles. The firm expects to boost its turnover by 20 per cent this year to £6.5 million, which will lead to the recruitment of new members of staff in the coming year to join its current team of 40 drivers, 11 office personnel and five commercial technicians. Managing director Keith Law founded the company in 2004, having worked in international fresh produce transportation for over a decade, and it has been steadily growing ever since. In 2008 it also became a member of the UK and European pallet delivery service, Pall-Ex, through which it moves around 1,500 pallets of goods each week. The new premises are a great boost for us, enabling us to increase the size of our storage business, whilst allowing us to operate and service all of our vehicles on-site. Our national fleet offers full and part load deliveries to and from anywhere in the UK, our specialist service from Yorkshire/Lancashire to London and back forming a large part of our work. Being part of a Pallet Network enables us to deliver smaller consignments of one to ten pallets overnight to any post code in the UK and Western Europe. Also new for 2013 our Biomass & Recycling Service will provide transport for the power generation and recycling sectors using four brand new walking floor trailers. Expanding the fleet wouldn’t have been possible without the support from Lloyds TSB Commercial, which has has been a key part in our development, and we are already looking at new expansion plans for the coming year. 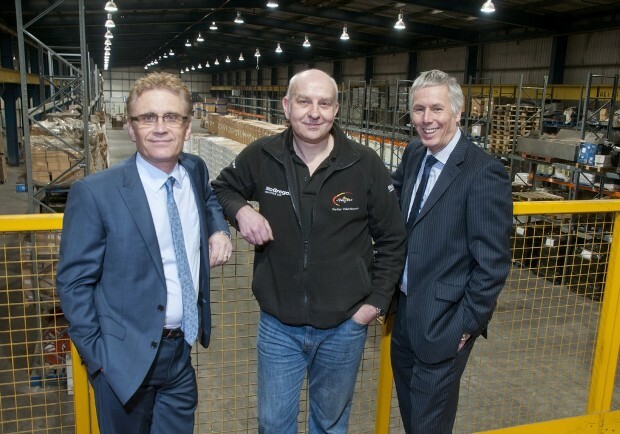 The growth of McGregor Logistics is a testament to the hard work and careful planning of Keith Law and his team, and demonstrates that there are always opportunities for strong firms to thrive and expand. The London 2012 Olympic and Paralympic Games contract was a great win for the company, which it’s continued to build upon by supplying high-profile venues such as Wembley Stadium, the Cardiff Millennium Stadium and the Croke Park Stadium in Dublin. We are committed to working with new and existing business customers in order to find the right funding package which best fits their needs, and have a number of tools at our disposal. As the first bank to draw down from the Government-backed Funding for Lending Scheme, we can now offer customers a one per cent discount on interest payments on all loans, overdrafts and hire purchase facilities.